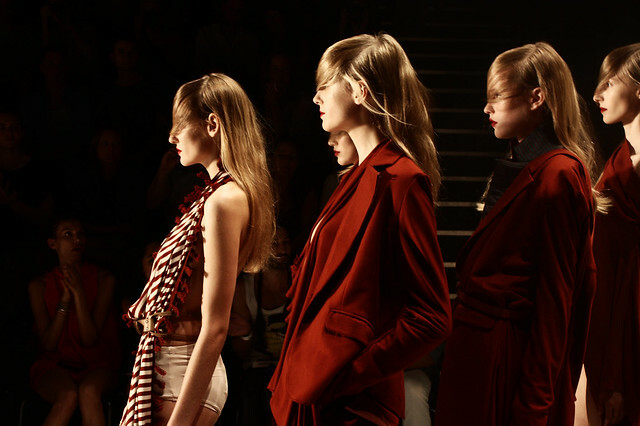 A. F Vandervorst closed this season´s Mercedes Benz Fashion Week in Berlin. I was lucky enough to have gotten a second row seat since the tent was so FULL. 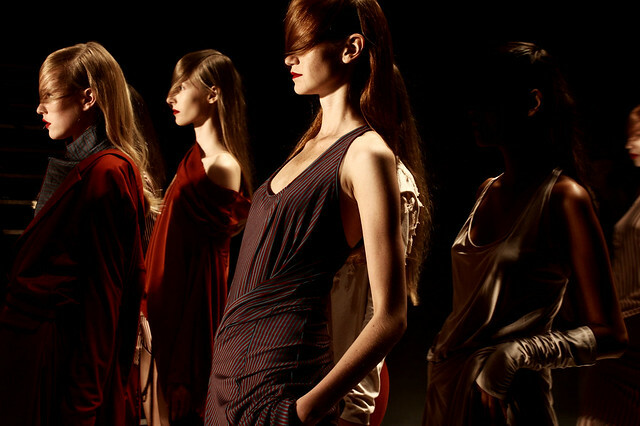 The design duo from Belgium presented their affordable collection, A. Friend which in my opinion was nothing spectacular but not bad either. I expected more since i really loved their collection last season. Stripes and reds (or maroon? ), side-swept models´ hair, smoke & lighting effects and the weird model walk (imagine playing the limbo game without the bar) were enough to make it to my list of the best shows that week though! Wouldn´t mind owning that off- shoulder top on the first pic! all photos were taken by me. please email me before using the pictures, thank you! I love this collection! The top in the first photo is amazing. its all so gorgeous, I love stripes and red, or maroon whatever its sooo pretty! i think maroon colour would be quite a big hit these autumn season! Ich bin grade ehr zufällig auf deinen Blog gestoßen und bin echt begeistert. Werde auf jeden Fall öfters vorbei schauen! Vielleicht magst du ja auch mal bei mir vorbeischauen? Noch habe ich kaum Leser, aber ich hoffe das ändert sich nach und nach. Gefällt mir gut. Zwar relativ schlicht, aber trotzdem ist das eine schöne Kollektion. Zu meinen Lieblingskollektionen wird sie wohl aber nicht zählen. on the streets of berlin. Hi, my name´s Anjelica and i am a pink-aholic! CRUISIN in my neon wheels with my candy shoes.